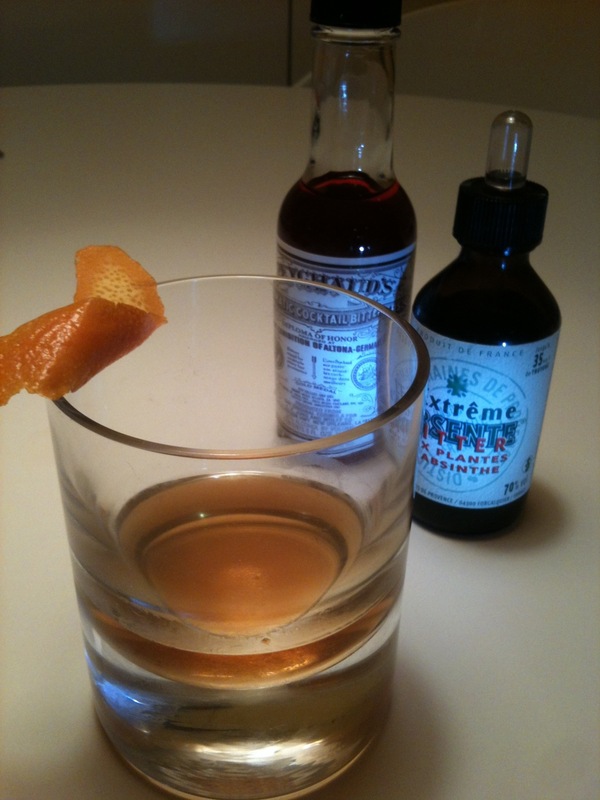 One of the oldest cocktail recipes, the Sazerac is very simple: rye, sugar, Absinthe & Peychaud’s bitters. The bitters are very important here: it has to be Peychaud’s, otherwise you are not making a Sazerac. The correct recipe uses a large slice of lemon peel. Tonight, I am out of lemons, so have substituted a slice of orange peel; I quite like this, and find the flavours more mellow, and very similar to an Old-Fashioned. The lemon gives the drink more zip, but this evening I prefer it this way. Chill the glass. Muddle the sugar cube with the Extreme d’Absente bitters (if you are using regular Absinthe, then rinse the chilled glass with a few drops of the Absinthe and drain) in your mixing glass. Stir the whiskey together with the Peychaud’s bitters and ice into the sugar mix and strain into the chilled Old Fashioned glass. Garnish with a large slice of lemon peel (or orange, depending on the state of your fruit bowl). Historical note: Louisiana’s Legislature adopted the Sazerac as New Orlean’s official cocktail on 23rd June 2008. Update: I forgot to credit the redoubtable legendary barman, Brian Silva, for making the first Sazerac I tasted when he ran the cocktail bar at Rules Restaurant. He noticed I had been drinking a Manhattan previously, and suggested I might like to try the Sazerac as an alternative. He mixed it the ‘correct’ way – chilling the glass with ice, then rinsing it with a quantity of Absinthe, before building the rest of the drink. The results were sublime. Further update: Brian Silva now runs the bar at Balthazar in London, and has written a book, which is highly recommended. You can read about his excellent career in an article in the Rake magazine. Love the Sazerac! It’s showing up on cocktail menus all over. I just had one at Foundation in Raleigh NC. They stayed true to the drink. Wonderful.